John Fish created the Jewelry School March 31, 2003, with the idea of helping those who are interested in the jewelry business. He and his family want to pass on their knowledge to those people who want to start their own career in jewelry manufacturing and design. Welcome to John Fish Jewelry School! John R. Fish started the business in 1955 along side his wife Elaine. They worked hard to create a name for their jewelry store, that was synonymous with quality. Their business became a family tradition when his three son’s John D., Howard, and Stephen Fish entered the jewelry store between 1976 to 1987 to work for their dream. Sixty one (61) years later their business is still thriving. Our knowledgeable instructor is Pedro Torres. He teaches all phases of jewelry manufacturing and jewelry repair. He brings 40 years of experience to the school. These courses include jewelry manufacturing and repair, jewelry repair with diamonds and other precious stones, and repair with basic stone diamond setting. We take pride in our work and we are passionate about what we do. Visit us today and get started on your new career path. 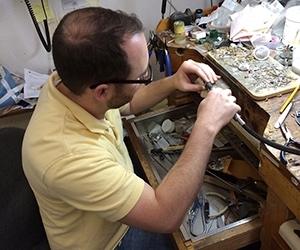 As a graduate of John Fish Jewelry School I would highly recommend this program to anyone looking to learn jewelry design, manufacturing and repair. I chose the longest program which taught me everything I need to make my own jewelry designs. 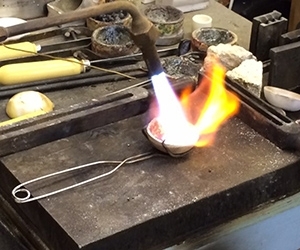 Wax carving, casting, soldering, polishing, repair and stone setting are just a few of the things you will learn. 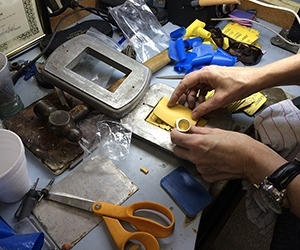 The instructor, Pedro, has over 40 years of experience as a jeweler. There is nothing he can't do when it comes to jewelry. He takes a genuine interest in each students personal goals for jewelry and helps you achieve them. His passion for jewelry carries into his teaching, which makes going to school there such a great experience. John Fish Jewelry School provided me with a fantastic learning environment and a solid education to succeed as a jeweler. This school is Awesome! The creativity that I am able to unleash is astounding to me. Being able to create a piece of art from raw materials gives me a since of fulfillment unmatched by any other. The one on one instruction is truly a mentor type of experience. The lay out of the learning experience is laid back and not stressful at all. This school is truly a diamond in the rough! The instructor was always happy to answer my questions and he was very patient with me. I was continually encouraged to be creative and make my own designs and would get personalized instruction. I have learned a lot in metalsmithing and other aspects of jewelry manufacturing. The price is more than fair and I would do it all over again! Everyone who works at John Fish has a big heart and they want to help others to become successful.